St. Louise School’s Pre-K teacher, Mrs. Wendy Blank, begins a joyful journey of learning and growing for your child in our four-mornings-a-week preschool program. The program is based on the development of the whole child, and our goal is to provide opportunities for every child to grow spiritually, physically, socially, emotionally and academically. The Pre-K classroom is a warm, supportive and productive learning community where each child’s faith, character and intellect can grow and thrive. The curriculum is child-centered and taps into each child’s innate curiosity about the world, laying the foundation for a life-long love of learning. Through meaningful, hands-on experiences, students are encouraged to explore, experiment and take risks. They have time to become absorbed in their chosen work and play, constructing meaning from their own discoveries. Classroom experiences foster self-confidence and independence; students know that they are able thinkers who can make decisions, solve problems and get things done. Our classroom provides a safe place to learn and a fun place to grow and interact with peers. Students collaborate, cooperate and compromise. Together, we build a sense of community and promote commitment to service in an environment that encourages students to care for themselves and those around them. An 8:15-11:45AM class that meets Mondays through Thursdays. An atmosphere designed to nurture Catholic faith and values and celebrate each child’s relationship with God. An intentional curriculum richly infused with literacy and math content. Whole group, small group, and individual learning experiences, including opportunities for choice and play. Inquiry-based projects linked to science and social studies themes. Music, movement, and art enrichment. Weekly music lessons with our school music teacher. Head teacher Mrs. Blank is joined by an instructional assistant, Mrs. Donna Neil; thus, with a maximum 18 students, the student : teacher ratio is at 9:1. An 11:45AM-2:00PM Monday session and 11:45AM-3:00PM Tuesday through Thursday session for up to 14 of the morning preschoolers whose parents choose this higher-tuition option. Lunch time, quiet time, and movement/recess time scheduled for each afternoon. Instructor Mrs. Maria Zambrano, and her assistant Mrs. Marilu De La Torre, supervise a maximum 14 students; thus, the student : teacher ratio is at 7:1. To see photos and more information of our Pre-K program, please visit Mrs. Blank's webpage. 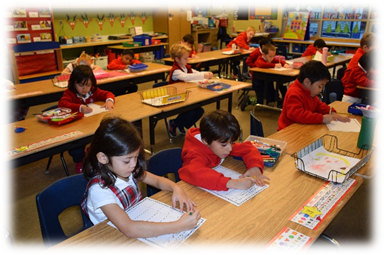 Our St. Louise Kindergarten consists of two classrooms taught by Mrs. Lauren Samson and Mrs. Karen Alleman. This full-day program caters to a variety of learning styles and provides a strong academic foundation. We have the most up-to-date and research based curriculum in reading, math, and many other core subjects. You’ll find in our Kindergarten curriculum a focus on teaching to the whole child – the physical, social-emotional, and intellectual parts of a five and six year-old. Just as importantly, we teach to the child’s spiritual side. Daily religion class helps our students develop a personal relationship with God. Gospel values are interwoven into every part of the day and curriculum. 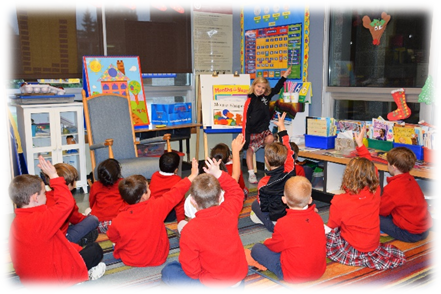 Kindergarteners learn Catholic traditions, attend Mass with the rest of the student body twice monthly, and pray and read Bible stories daily. 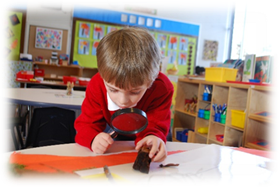 The development of a love for learning through fun and interactive activities. A math program which uses manipulatives, problem solving, and learning basic math skills such as addition and subtraction. A reading curriculum which exposes the kindergartners to literature using three different leveled readers, a vocabulary reader, and a collection of phonics stories in a student book. A full spectrum of lessons which include personal safety, Foss Kit science, Story Path social studies, and current event discussions through Scholastic News. The acquisition of the value of serving others, as evidenced by kindergarten’s involvement in two unique charity projects throughout the year - collecting items for the Eastside Baby Corner and purchasing Teddy Bears for the Bellevue Fire Department – and their involvement in three other school-wide service projects. Weekly specialist classes in computers, art, music, library, and physical education. An instructional assistant in each classroom - Mrs. Vicki Cam or Mrs. Kathy Kirby – and a class size that is typically 16 students; thus, the student : teacher ratio often is around 8:1. To see photos and more information of our Kindergarten program, please visit the individual webpages of Mrs. Samson and Mrs. Alleman. Click here for more information about early childhood education.